A total lunar eclipse will be observed on December 10 which will be the second lunar eclipse of the year. The next total lunar eclipse , visible entirely from India will only be after 7 years. On December 10, the moon will start falling unser the Earth's shadow at around 6.15 pm. The shadow will completely cover the moon at 7.36 pm. Then the brightness of the moon will be reduced to less than 40 percent of its original brightness. The moon will stay in the umbra until 8.28 pm. 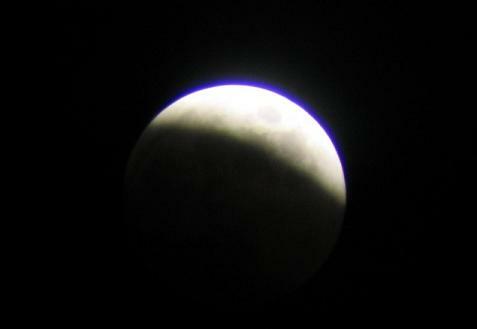 It will completely exit the umbra around 9.47 pm. The first Total Lunar Eclipse was on June 15 when monsoon clouds had thrown a wet blanket for sky watchers. The December 10 eclipse is likely to be more visible, said Dr. D.P. Duari, Director of Research and Academics of the M.P. Birla Planetarium. 0 Response to "Total Lunar Eclipse on Saturday, December 10"